AMAZING SPARKLE, CLARITY AND WEIGHT! Elegant 26.5 oz. 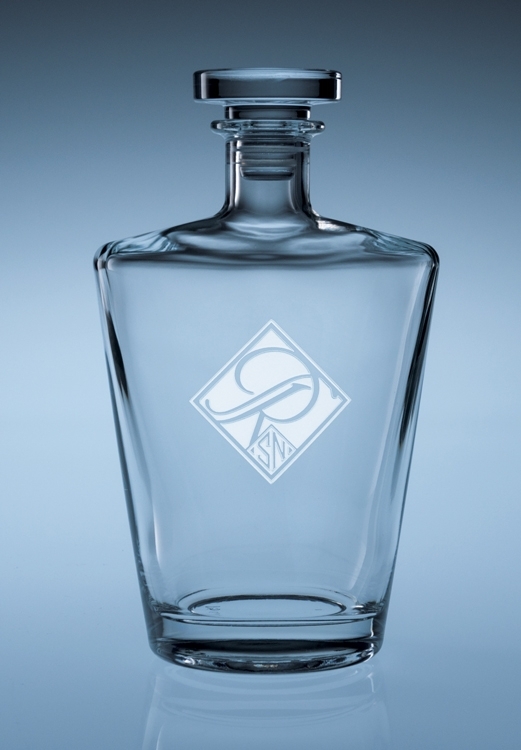 Decanter of machine-blown glass that features European quality and an airtight stopper. Dishwasher safe which is unusual for decanters of this quality. Prices include a deep etch imprint in one location. IMPRINT: Deep etched in a 3.5"h x 3"w area in one location. See “Options” above for additional imprint information. PACKAGING: Includes individual designer gift packaging, see Options above for details & photo. QUALITY: Q117 - This is machine blown glass and small imperfections may occur but are not very common. Dimensions are consistent. Glass walls are medium weight. Glass is colorless. Excellent sparkle. Barware is dishwasher safe. Stemware is dishwasher safe providing the dishwasher is not too crowded. Not suitable for hot liquids.